← Still Monday – Mustafa asks me for drugs. Tuesday 28th October – I see McArabia on the menu and I’m licking my lips. The call to prayer here was a bit softer and more musical rather than the drone we sometimes heard in Fes and as usual I woke at 5.30 am wondering what the time was only to have the sweet sounds wash over me. It’s a lovely way to start the day but I won’t be buying the CD. Today was a mixed bag as we headed first to get a taxi to the train station and ended up walking there. Took about an hour with a coffee stop. Everything is pretty rigid here. You can have the traditional harira soup and bread which most of the locals are eating, or coffee and crepes if you’re a bit more up market. I’m not meaning you can select. It’s just coffee and crepes. No other options at those places. Then the tourist cafes where you can have a selection but each place has pretty much the same selection. 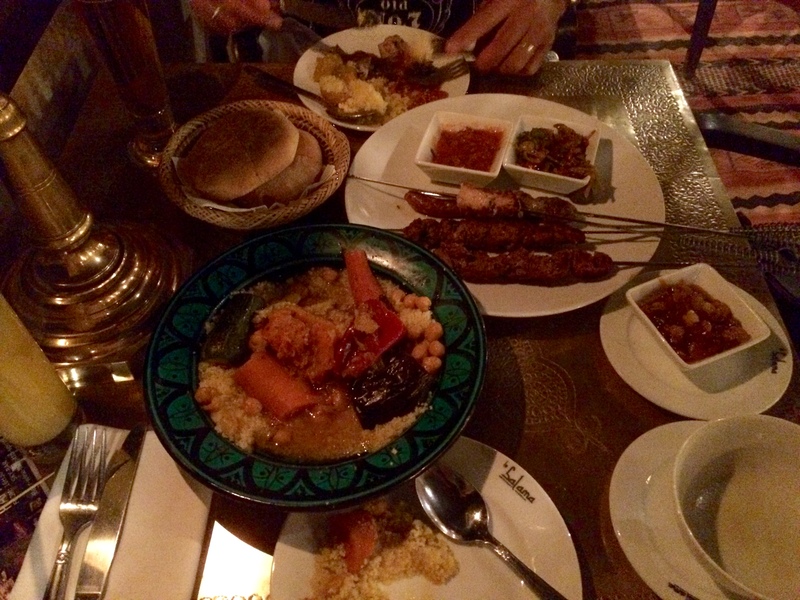 Couple of simple pasta dishes, the tangier and cous cous option or pizza…but not before twelve noon. And then the tourist hotels where you can order from a larger menu, but boy is it expensive. We bought some breakfast food today to tide us over next couple of days as we do miss cereal and the local places are filled with men starting their workday. No women. We went to the train station to get our tickets to Casablanca. Funny these place names are familiar from I feel maybe old time movies? We buy tickets from the sourest man there and Gilbert smiles and says thanks ‘Happy’ as we leave him and then we turn and see McDonalds there. Gilbert wants to look something up so he says “if we can access wifi we’ll have McDonald’s ok?” We would be lucky to have McDonald’s once in six months at home and I usually would have anything but that, but ok. We walk in and the smell is amazing. My mouth starts salivating. I look up at the board and see McArabia and a lady with a portable order thing asks me what do I want to order, so I ask if they have wifi. “No”, she says shaking her head. I turn back to Gilbert and tell him they haven’t got wifi but I’m staying anyway. It smells soooo good. From here we walk out and straight away we are bombarded with offers of taxis. Katy has told us we shouldn’t pay more than 10dh but no one would accept it on the way here and no one will accept it now. The temps up now and I’m not walking another half hour. We end up at 30dh and are taken to Majorelle gardens. 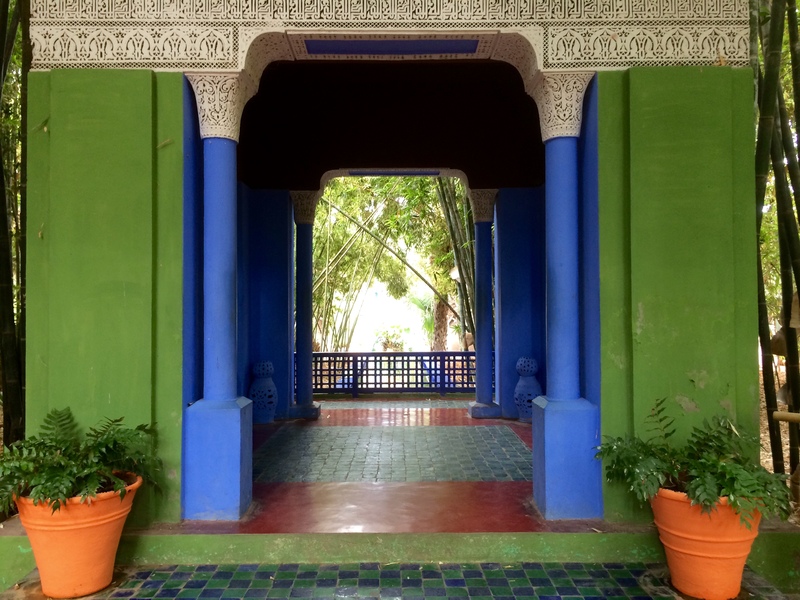 This is an oasis of private gardens in the middle of the dusty, dry chaos that is Marrakech. It costs us 50 d each to go in and I probably wouldn’t have if the kiwi woman we met hadn’t recommended it. She lectures in garden design. It was nice, not fantastique. Maybe I’m a little jaded? They made great use of colour with the strong primary colours contrasting beautifully with the green. 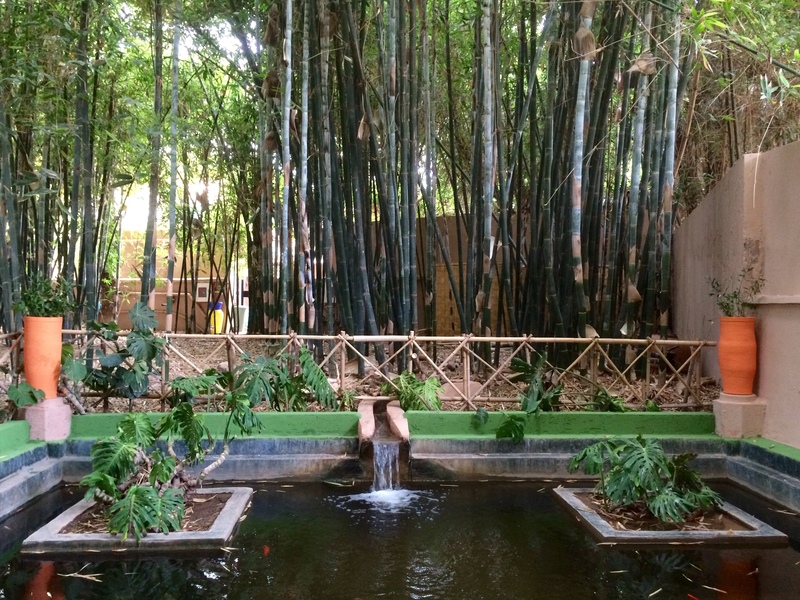 A tropical garden with the bamboo and vertical and horizontal elements. I’m thinking we could do with some of these pots at home. From here find the super market with directions from Katy. It’s in a shopping mall that seems abandoned. The escalators are not working either. We grab a few bits and Gilbert points to a lift that a number of young women are about to step into. The lift is not that big and I just touch Gilbert on his shoulder and say we’ll wait for them to go. I don’t know how they’ll feel about him getting in in his Jack Daniels singlet and shorts but as the door closes they notice us standing there and a couple put their hand up to stop the door and motion for us to get in. It stops just over halfway but won’t reopen and the security guard comes over and gives it a bit of a kick and it starts to close. I motion It’s ok, we’ll go after and step back to wait. Once again no one will accept less than 30 for a taxi but I’m way too hot and tired to walk so after trying the walk away with three or four accept and ask to be taken to the big square. I bought a 2 litre bottle of water a couple of hours earlier and have drunk almost all of it myself. We have decided to buy a wheelie bag for all our treasures to make it easier negotiating our few upcoming flights. From here to Heathrow, HR to Malaysia. KL to Langkawai. LK to KL. KL to home. 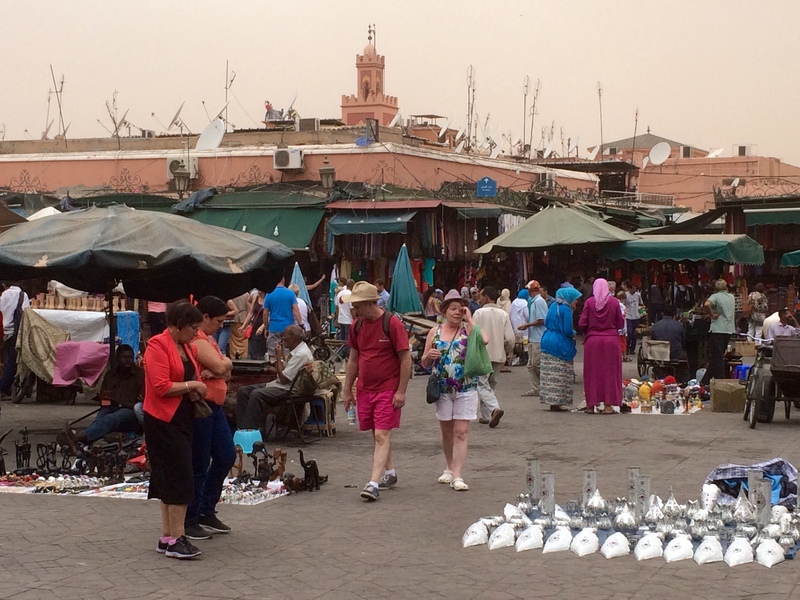 We don’t really need another bag and don’t fancy the bartering but steel ourselves and head into the market place. Here we find snake charmers, and monkey handlers among all the sellers, henna applicators, food stalls… Hell, about anything you could ever want! We had been warned. Don’t go too close to these guys cause they may throw the snake around your neck or the monkey onto your shoulder while you are unaware and in your shock they soothe you and encourage you to take pictures. They take your camera out of your hand so a couple can stand together, and click away and then as you go to leave smiling they demand a figure…and get pretty aggressive should you not want to pay this. The snake charmers music is pretty terrible. It sounds like a kid has picked up and is exploring the sounds. I wouldn’t call it a melody. They poke and annoy the snakes so they will stand up for visitors. It’s pretty horrible. In my naivety I thought the snake enjoyed the music and is ‘charmed’ but it maybe it’s standing up ready to attack cause it’s annoyed. It’s pretty horrible all round and I feel really sorry for the snakes. The monkeys at least seem to be having fun but I have no doubt it’s not all roses. We watch for a while and then head into the bag area. It’s not easy and we have little patience for the game today. We’re not rude but we’re not playing the game either. We select a bag finally and head on. I buy the handbags I had chosen the night before from a really lovely boy who isn’t high pressure. Gilbert’s happy to wander further and just people watch and observe the buying and selling before we head home but it’s been a big day and I’m really ready for a shower and a rest and glad when we get there. Andrea and Jacob who are also staying with Katy are home. They are a young Canadian couple who had set off at 5.30am for a tour that included a balloon ride and a camel ride. We swap stories of our day and they seem really happy with theirs which is awesome. We both want to go to a fish restaurant Katy has recommended and decide we will go later tonight. We pack our bag and everything fits perfect. Ready for the next leg! 3 Responses to Tuesday 28th October – I see McArabia on the menu and I’m licking my lips. Thirteen days, ren! Belly dancing tonight i think!